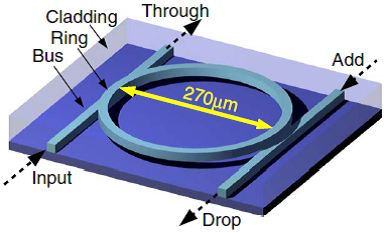 The invention has been conceived by adopting a Dissipative Four Wave Mixing (DFWM) approach, termed Filter Driven Four Wave Mixing (FD-FWM), in which a filter and non-linearity are combined in a single device, thereby surpassing stability problems of the previous DFWM systems and allowing for unprecedented control of the laser output parameters, such as repetition rate, pulse duration, power and stability achieving stable and ultrafast oscillation with a simple and compact laser design. This results in a significant increase in performance, lowered costs, compact size, and decreased power consumption. The laser provides very high repetition rates (200 Ghz). Operating in an “overtone” regime results in oscillations at a repetition rate of 800 GHz which is one of the highest repetition rate ever obtained without multiplexing. The main element of the lasers is built using a CMOS compatible technology platform as well as commercially available elements. This enables a cost efficient production of the laser. Future generation telecommunication networks will need efficient high-performance sources providing extremely stable optical clocks at very high pulse repetition rates. Our technology exploits a frequency bandwidth limited amplifier, as well as dispersive and nonlinear elements. The low loss monolithic high-quality factor nonlinear microring resonator is the basic laser component and combines the nonlinear components and the high finesse resonant filter added into the cavity. Our laser, based on a microring resonator, were patented in 2013 US 8,599,887 “Stable mode-locked laser for high repetition rate operation”. Recently, we built up a microring resonator prototype fully based on commercially available low-cost components with the goal of testing its performance and long-term stability. Now, we are applying it to telecommunication devices. We are looking for industry and academic partners to further foster the development and application of the microring resonator technology. Potential partners can be from all stages of the technology and production chain for example manufacturers developing and producing laser systems at telecom wavelengths.